We have heard a lot recently about how stem cells can be used to help patients who would typically require the implantation of an artificial joint such as a hip or knee. 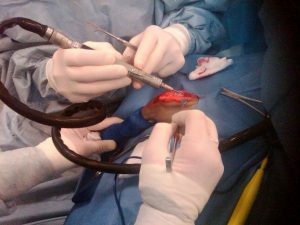 Using one of these methods, doctors are able to remove bone marrow from the patient and use the stem cells in the bone marrow to attempt to regrow bone tissue and joint material inside the patient. While this method may work, it is only one method doctors are using with stem cells, but there are others. In a recent news feature form HNGN, doctors are now using stem cells to regrow cartilage in a laboratory and then implant that it into the patient. Since the cartilage was grown using the patient’s own stem cells, the new cartilage will have the same DNA as the patient. This should mean that the body will not see the new cartilage as a foreign substance, so there should be no risk of rejection, which is always a major risk in an organ transplant or event the implanting of an artificial joint like a knee or hip. This new procedure is done with the assistance of a procedure using stem cells and what are known as 3D textiles. The new product is being developed by a company the manufacturers bio-artificial medical devices. The benefit to this method is that young patients who are in need of a hip replacement due to arthritis could use it. Most arthritis in young people is caused by sports and exercise injuries. After a knee injury, for example, where a patient has surgery to repair the damage, there is often arthritis that results and will get better over time. With this procedure, researchers take the stem cells and place them on a textile ball in the shape of human hip joint. The ball is made of a printed 3D plastic, but this plastic will break down over time and leave the new cartilage in place. These cells are also genetically modified or “programmed,” as doctors call it, to reduce any inflammation. One reason why it is important for researchers to find other options that traditional hip or knee replacement implants for younger patients is because they will likely live for many years after the operation, and the new hip or knee will only last between 15 and 20 years on average, and this will result in the need for a second or possibly even a third surgery. While this new technology shows promise, it has still not been tested in humans, and there will be some time before they move on to human testing, assuming everything goes according to plan. For this reason, traditional hip and knee replacement surgery will be the only option for quite some time. In the vast majority of cases, patients who undergo a traditional hip replacement procedure will not have any major complications; however, if the doctor unknowingly implanted an artificial hip that was defectively designed, there is a much higher chance there will be a partial or total device failure that will result in significant pain and suffering and other personal injury damages.